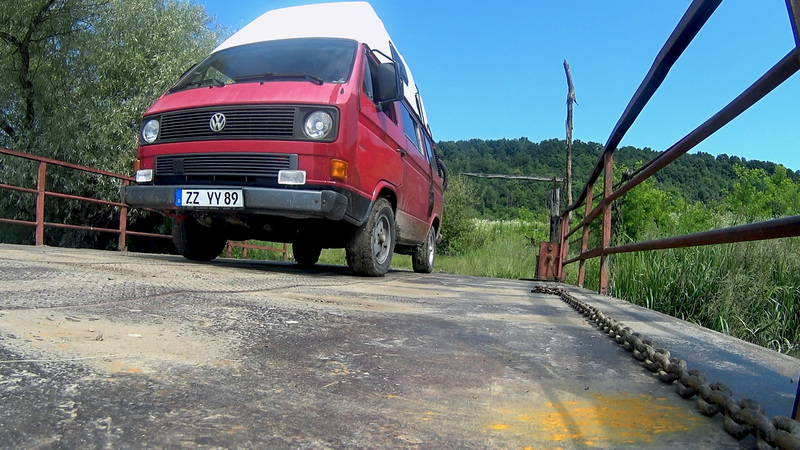 Making it out of the back roads and arriving back to civilization, I set my mind for the next goal in Romania. 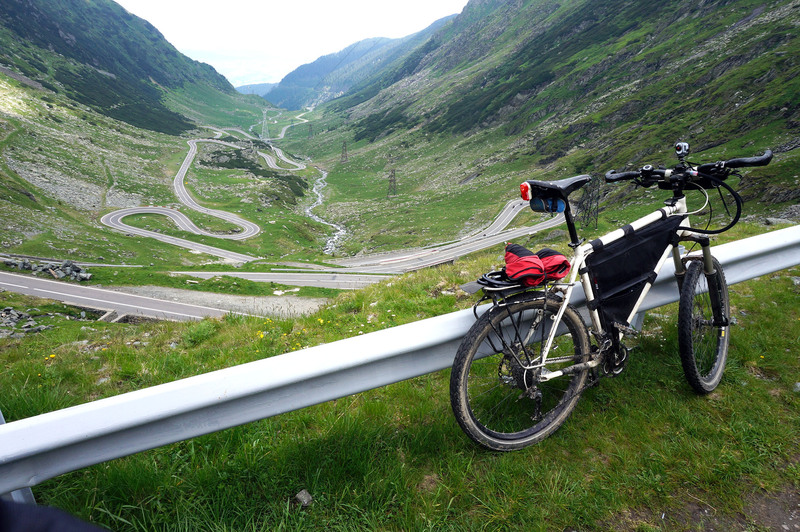 I wanted to go and drive on the mountain road that was voted best road of the world by Top Gear UK, the Transfagarasan Highway. Coming down from the north from Cluj-Napoca I took some back roads along the beautiful Romanian countryside and was going to take the ferry across a small river to get to my Campground which is almost right at the start of the Transfagarasan. So the road kept winding along getting smaller again as I got closer to the mountains but finally I had the Carpathians in sight again and the ferry was just a few turns away. My GPS showed that there was just a small forest road leading down to the departure point. Having learned my lesson the last time I left the car on the main dirt road and walked down to check if the ferry was even there and what its schedule was. I found the ferry to be there and afloat, but abandoned. Being unsure if the ferry driver will come back later or not at all I managed to find a fishermen and tried to ask about the schedule of the ferry. Me: But there is no ferry driver? Well, good thing we got that clarified. Help yourself it is then. Since there was no bridge close by either and I didn`t want to go all the way back that I came I took the bus down to the ferry to get it across somehow. The first problem was that there was a big step up to get onto the ferry at all. When I attempted to just drive onto it, try pushing over the step, I ended up pushing the ferry away from the shore and the bus almost into the water. 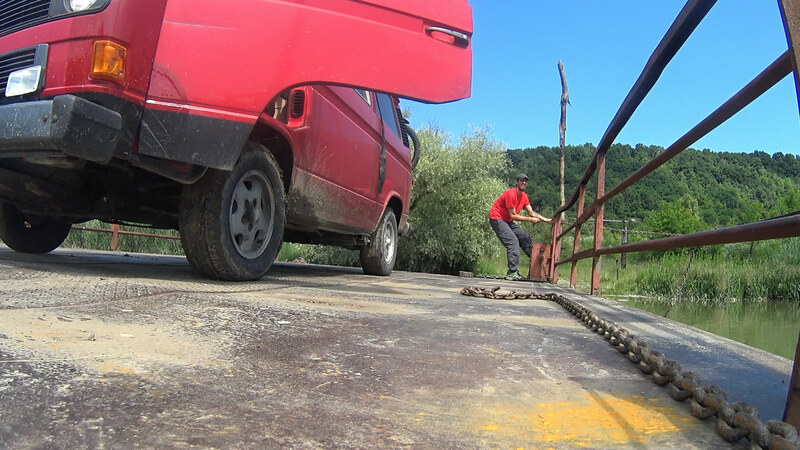 After pulling it back in and securing the anchor chains more tight and getting the sandboards (I`ve been driving all around the place) into action I made it save onto the ferry. Now I had to try again to push the ferry away from shore with the bus on it. The first try showed that the bus was still putting to much weight onto the land and the ferry wasn`t floating yet. After rolling more to the front I got free of the shore, hopped onto the ferry and was gonna start pulling myself across using the guide cable that is strung across the river. At this point I had drawn the attention of a few fishermen from the other side of the river, who where yelling instructions across to help me. As soon as the ferry hit the current of the river I realized I had made a mistake. I didn`t shorten the connection chains from the ferry to the guiding cable enough, I wasn`t able to reach the cable anymore to pull myself forward. Alternatively pulling with all my strength at the chain and securing it closer to the ferry I managed to get closer to the cable and was eventually able again to start pulling. The trick was to leave the back chain longer, so the current will push the ferry because its at an 30-40 degree angle to the current. Learn something new every day :) After 20min I finally reached the other side of the 40m wide river, no record time I guess, but I made it. At that point there where already some cars gathered and I thought they wanted to get back across to the other side. Actually they just came for the spectacle and left when I made it off save on the other side. Better than watching a movie I guess :) Being on dry land again, sweating waterfalls I was happy to get to my campground and take a shower before going up to the mountains the next day. Back at the Campground I made further plans for the trip towards the Black Sea. 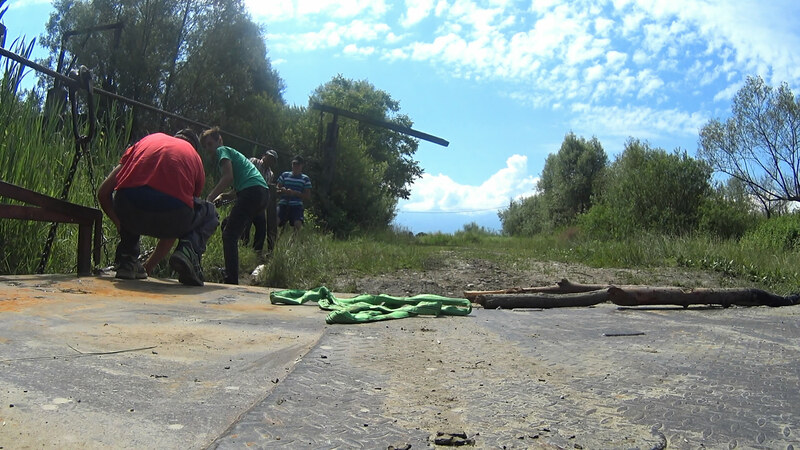 Next I wanted to see the mud volcanoes and go to the Danube (Donau) River Delta at the Black Sea. 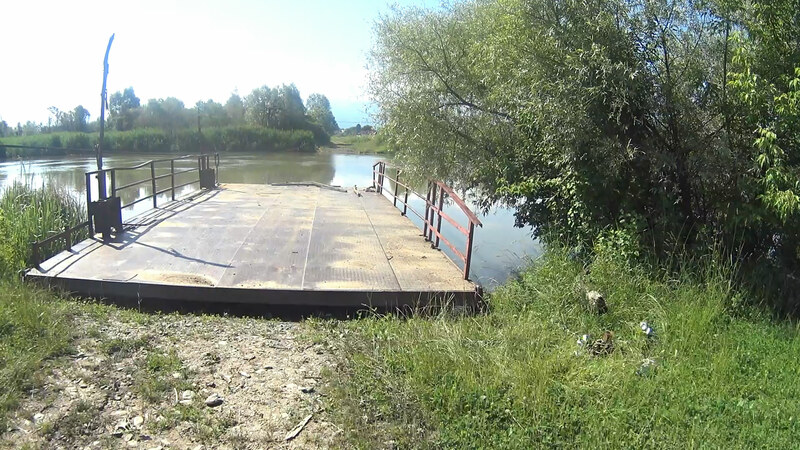 The next post will have an unexpected Overlanding meeting and astonishing nature from the Danube Delta. After that it’s the surprising grand finale of the Romania Saga that put a twist onto everything.